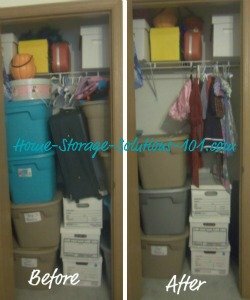 I tackled the project of kids' closet organization this week, for Week 44 of the 52 Week Organized Home Challenge, which was all about organizing closet space for your kids. I did this challenge in two parts. First, I worked on purging stuff from the closets themselves, and second I focused on organizing the kids' dressers, some of which are located in closets (but not all). I've got three kids, so getting all of their closets in tip top shape this week would have probably been too much work for me. I actually anticipated that so, like I said in the challenge itself, I just did the most I could and am planning on improving on their closet situations during the rest of the challenge. My focus was on switching out their clothes from the warmer weather clothing to the clothes they need now that it's getting cool. That was the most pressing concern for me, and while I had all the clothes out I went ahead and did a big purge of clothing that was too small for any of them to wear again. I have two girls so the younger one can inherit all the older ones clothes, so I store all the too small for the oldest girl clothes for the younger one. The closet you see above is the one I use to keep all the tubs of stored clothing, along with some additional storage which is why it looks pretty full. I also threw away a bunch of old shoes that were too small for anyone's feet and too beat up to donate to anyone. decluttered more, but it is far improved and I'm very happy with it. I can already tell it will be much more functional now. I also focused on making the children's dressers and other drawers not so cluttered and crowded. I started by doing a lot of laundry over the last couple of days, washing stuff that needed to get stored and washing stuff that was coming out of storage. Once you know how much clothing you've got you can purge enough stuff to make sure what is left in the dressers and drawers will actually fit in there well. We were having a problem with our son's clothing drawers, because they were too full and he wasn't closing them properly because of it. 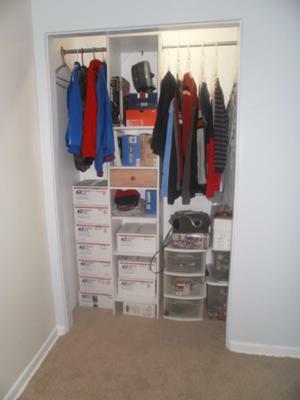 The before picture is what it looked like right before we started working on his room and closet. I did not open the drawers myself. After the challenge his drawers are still quite full (and honestly it would be better if they had even less stuff in them) but at least they can easily close now and are more tidy. While I had everything out I also made note of what items the kids may need more of, such as more pants or dress clothes, etc. They can make it for a couple of months with what we already have, but now I know what to ask relatives for around Christmas who want to buy the children some clothing. That way we get stuff they really need, and it will get worn more that way. 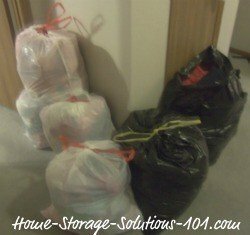 I thought it would be fun to keep track of how much stuff I'm removing from my home as part of this challenge. Each week I'll update my running tally. This is the first week I've started adding, even though it's technically week 44 of the challenge, since we're just jumping into it now. Well, that's how I did on this week's challenge for kids' closet organization. (You can read the organizing closet space for kids challenge here). I would love to hear how you did too, or see before and/or after pictures. You can share your own triumphs here, and I'll feature them in the Home Organization Hall of Fame. Are you new here? This kids' closet organization challenge is part of the 52 Weeks To An Organized Home Challenge. (Click the link to learn how to join us for free for future and past challenges if you aren't already a regular reader). Lisa shared this picture on Home Storage Solutions 101's Facebook wall. This is how we organized my son's new room. They had already put up a closet organizer, so we were sort of forced into going thru EVERYTHING which helped immensely. There's still plenty to sort out yet, but at least it's functional and he keeps it this way. Not bad for a teenager! Closet organizers can be such a big help in organizing a small closet, if you've got the money to purchase one and the time and know how to install it. 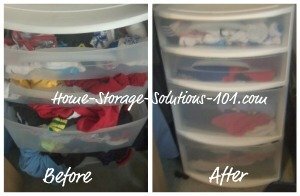 In addition, you can see in the picture that Lisa also used some plastic drawers to house even more of her son's stuff, and I love these because they work so well in many closets and aren't too expensive. I actually use a variety of these plastic drawers in several of my closets and the kids closets in my own home. There are several varieties available, depending on what will fit best in your closet. (See examples below). Do You Want To Be In The Kids' Closet Organization Challenge Hall Of Fame? If you've done Week # 44 of the challenge, which is to organize your kids' closet space, then I'd love to see pictures of what you've accomplished too. You can send in your own hall of fame pics to the Creative Storage Solutions and Home Organization Hall of Fame.